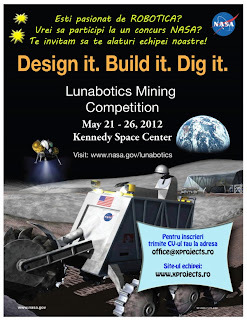 Echipa Xprojects participa la Lunabotics Mining Competition. NASA's Third Annual Lunabotics Mining Competition is a university-level competition designed to engage and retain students in science, technology, engineering and mathematics (STEM). NASA will directly benefit from the competition by encouraging the development of innovative lunar excavation concepts from universities which may result in clever ideas and solutions which could be applied to an actual lunar excavation device or payload. The challenge is for students to design and build an excavator, called a Lunabot, that can mine and deposit a minimum of 10 kilograms of lunar simulant within 10 minutes. Incepand cu saptamana viitoare (1 octombrie), intalnirea Tehnorama se muta marti seara, tot de la ora 19:00.